Pro TriB12 contains an active forms cobabmide and methylcobalamin as well as the active intermediate hydroxycobalamin. Vitamin B12 deficiency can have many negative health implications from neurological dysfunction, mood disorders, megaloblastic anemia, cognitive decline, and more. The multiple forms of vitamin B12 provide the most comprehensive coverage by exploiting the distinct benefits of each form. Cobamamide is considered the active form of b12 with a proclivity to mitochondrial function. Methylcobalamin is widely regarded as best suited for neurological dysfunction. Hydroxycobalamin provides unique support by acting as a precursor to both forms as well as its distinct chelating properties. 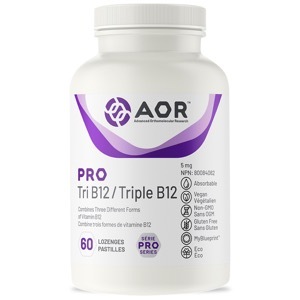 With Pro TriB12, AOR once again progresses the use of well known vitamins and their active forms. Providing the most comprehensive, and physiologically relevant vitamin b12 supplement available.